This entry was posted in News and tagged CKRSD, kamatapur, Koch, Koch Rajbanshi, nalini ranjan ray. Bookmark the permalink. I am thankful to CKRSD for uploading my book in the web page. I do hope that our fellow countrymen, will access the portal and read about rich historical background of Koch Rajbanshi or Rajbanshi community and their problems relating to social, economic, linguistic, cultural and political aspects. I shall be happy if this book of mine succeeds in bringing some awareness and awakening among these hapless, identity-crisis laden Rajbanshi people. Wishing the readers a happy reading. thank you very much for your comment and co-operation. You may get hard copy of the book from the publisher M/s Vicky Publishers, Saraswati Apartments, Chilarai Nagar Path, Bhangagarh, Guwahati – 781005, Ph. 0361-2451586, M-9435010632. I m feeling really happy and wish u all the best for ur research and developement of rajbongshi language . Yes, we do have dictionaries in Rajbanshi/Kamtapuri language. 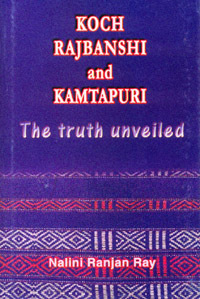 At this moment I can name a dictionary ‘কামতাপুরী অভিধান’ – সুজন বর্মন (‘Kamtapuri Abhidhan; written by Sujan Barman, published by Kamtapuri Bhasha Unnoyan Porishad, Dinhata, Babupara, Ward No.2, Cooch Behar. Thankyou sir, for uploading this book.It may help me a lot to know about the history of the koche or Rajbamsis of India as well as Nepal .